For my third trip back to the far reaches of distant science fiction, I’ve actually picked something written before I was born. The results were so successful I am tempted to go back even further for the next venture and choose something from the 1950’s. All suggestions are welcome. In the far future, helmet fashions will take a disappointing turn. 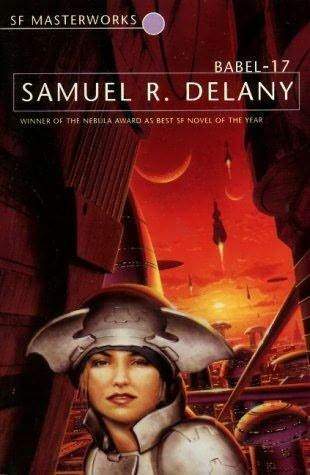 1967’s Babel-17 by Samuel R. Delany is the first book I’ve read in a while that I felt outclassed by. The concept is relatively straightforward – in the midst of a protracted war with an alien aggressor they call the Invaders, Alliance Headquarters discovers mysterious static-like radio bursts associated with a series of successful sabotages. After military cryptographers fail to decode them, they hand them to Rydra Wong, starship captain and poet extraordinaire to interpret. She quickly determines that Babel-17, as they call it, is not a code but a language. What follows occasionally resembles a linguistics professor’s fever dream. Babel-17 is, as best I understand it, a massively compressed set of linguistic rules that expand consciousness and exert influence the more it is understood. The plot basically charts Rydra Wong’s growing comprehension of the language, while bouncing from one action scene to the next. In terms of action, the plot is straightforward; having figured out where the saboteur will strike next, Rydra gets a crew together and flies off to a secret weapon factory on the distant planet of Armsedge. She hunts the meaning of Babel-17 while contending with a saboteur in her own crew, exotic arms designers and space privateers. Rydra Wong is a delightful lead character – charming and capable, with the aforementioned ability to read body language and predict behaviours, a polyglot and so accomplished a poet that grizzled space pirates on the fringes of human territory prize her collected works. Several characters fall instantly in love upon meeting her, which I suppose steers her into Mary Sue territory, but to hell with that noise. She’s too interesting for denigrating labels. Okay, and maybe I fell in love with her too. A distant future where poets are the equivalent of rock stars does have a certain mad appeal. This book has so many weird elements it’s hard to know where to begin. The universe includes transhumanist-style body modification (long before that was a term), the partial inclusion of ghosts into society (or at least into military roles), strict rules requiring polyamorous relationships in key military roles, and body language reading so refined as to be indistinguishable from telepathy. Those are just the highlighted features; Babel-17 stuffs its 200-odd pages to the brim with cool science fiction concepts and social changes. Unravelling the mystery of Babel-17 prompts numerous discussions of concepts of mind, perception and the impact of language. Some of the discussions are fascinating, though I confess I found a few of them impenetrable (or rather I had to take the characters’ word for it that certain discussions made sense, because I lacked the mental framework – or perhaps the patience – to decipher them for myself). The frequently repeated mantra, that an idea cannot be understood until a language has a word for it, is intriguing (if perhaps debatable) and drives much of the mystery. From there the complexity of some of the ideas got away from me. Usually when science fiction leaves my reading comprehension behind (because it’s full of maths, or physics, or completely fictitious maths and physics I’m looking at you Greg Egan) I just let my eyes slide over the technobabble until I can pick up the thread again. In Babel-17‘s case, I felt bad about doing so; I felt obscurely like I’d let Delany down by not trying hard enough to get it. It was a weird sensation. I think maybe Babel-17 did something to my brain that made me want to read it again and again until I get it right. This entry was posted in Visiting Classics and tagged babel-17, flowers for algernon, greg egan, robert heinlein, samuel r delany, the moon is a harsh mistress. Bookmark the permalink. – are you going to try to write something too baffling for me to follow? I’ve already rushed out and read it based on your review – and mea culpa, I have never read *any* Delany before as far as I can remember. It must have been something else I was trying to get you to read in high school – Viz, maybe? Maybe. I wonder who was trying to foist Dhalgren on me then?